Is your business a labour of love? 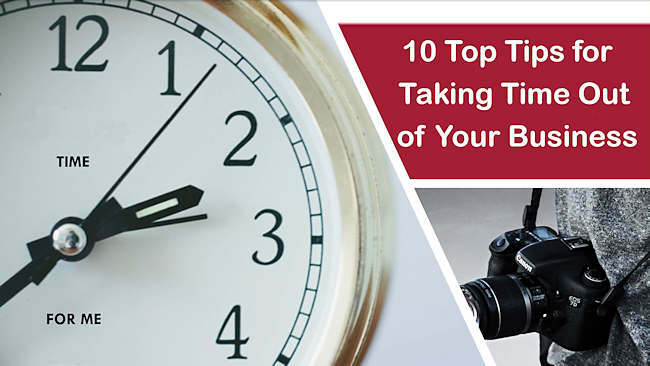 If you’re thinking about taking time out from your business, read my 10 top tips! 57% of small-business owners say they work six or more days each week. In sharp contrast, only 7% say they work fewer than five days each week. 62% of small-business owners say they work 50 or more hours each week. As if that’s not bad enough, A high percentage of small-business owners work while on their holidays, with 81% saying they made or returned business calls, and 52% initiating or answering e-mail. So are you satisfied with your ability to achieve a positive work-life balance? With all the pressures of business and the responsibilities that go with it, how important is it for you to take time out? Research has shown that 1.3million small business owners were suffering health issues due to the pressures of running a small business, with 660,000 of those feeling that it had a very adverse effect on their health. How much better would your business be if you actually worked fewer hours, took time out and worked ON the business, rather than IN it? Almost everything will work again if you unplug it for a few moments, including You! Finally, remember to allocate specific times to work ON your business. Should you chose to continue to work all the time in your business without giving yourself time out for relaxation, contemplation and growth, you will find it extremely difficult to progress and grow your business to achieve your core goals. Create the opportunity to take time away from the business to increase your skills and to enable you to create strategic plans to take your business forward to the next level. Use your diary and schedule at least one day a month out of your business to focus on the future. Nor sure where to start when taking time out from your business, finding it difficult to set those big goals, don’t know what you don’t know or simply needing someone to question the status quo? Call me on 01280 700405 or click here to ping me an email and let’s see how I can help you. When you are married to your work partner it’s not all black and white! Today, there are more and more married couples in business together than ever before. Being married to your work partner, whilst still, a family business brings its own complications and areas that need to be managed carefully. 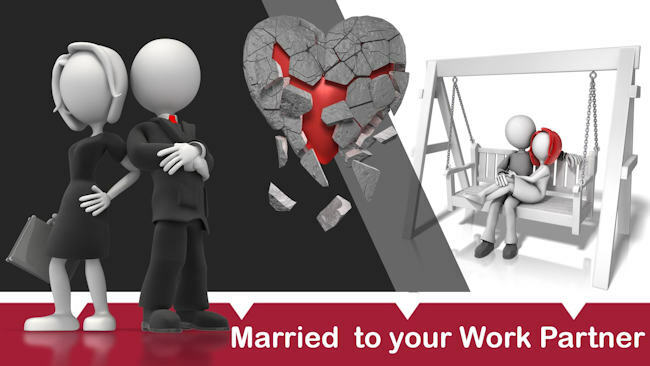 “One client often refers to me as their business coach AND a marriage guidance councellor! I am really not sure about the last bit but do understand how during our regular meetings both areas tend to cross over. It probably can’t be helped when you’re married to your work partner. Good planning is crucial to ensure all business goals are concurrent with life goals, and timelines are synchronised to run a successful profitable and sustainable business. There was a record 5.7 million private sector businesses at the start of 2017. Small businesses accounted for 99.3% of all private sector businesses; at the start of 2017 and 99.9% were small or medium-sized (SMEs). The majority of population growth since 2000 has been due to non-employing businesses, which accounted for 89% of the overall increase. Non-employing businesses accounted for 79% of the overall 197,000 increase in the last year. It’s not uncommon to see couples decide to go into business together. The close relationship, shared goals, and unwavering support they have together often make entrepreneurship seem like a natural fit. According to Forbes, here’s How To Tackle The Biggest Entrepreneurial Challenges when working with family and/or partners, and how to overcome those challenges for a successful personal and professional partnership. Explore each other’s values, assumptions, strengths and needs. Document and agree to some clear guidelines that define how you will honour the other person’s needs, and clear up assumptions. Clarify how you will make decisions, and talk about guiding principles for your business and how that relates to the future you see for both your business and your relationship. It’s important to make sure that all legal and contractual measures are in place before any business partnership takes place, even in a marriage or intimate relationship. It allows the business to have a solid foundation independent of your personal relationship. No matter what part of the relationship may turn sour, your business interests are protected, and a plan is in place to move forward. The biggest challenge I’ve seen is the clear line between who is ultimately the boss. Someone needs to make the final call, and that needs to be determined in advance for different situations, otherwise, roadblocks become impassable. I find that clearly defining roles and responsibilities in the partnership, and respecting those, can be a huge step to having success. Couplepreneurs often spend far more time together than average couples. To avoid relationship burnout, try not working in the same space. If that’s not possible, make sure your roles are clearly defined and separate so, your roles don’t collide, and you complement one another. Remember to make a designated date night on a regular basis where you don’t discuss work and enjoy a shared hobby or nice meal out. Successful couplepreneurs separate their work and home life. They define clear boundaries around their personal time. They disconnect from business issues and business talk at the end of the workday. They invest in their relationship by planning fun activities. They also have lives apart from each other, spending time with their individual friends. I have a vast amount of experience working with family-owned businesses and businesses in which the work partners are also life partners. I am versed in dealing with the unique challenges these businesses face. GDPR is going to have a major effect! Will you be caught out? Previously, contact forms could have ticked opt-in fields and data could be held for as long as you liked (such as unsubscribed email addresses so you didn’t add them again). Thanks to GDPR, everything has changed. Did you know that the fines could be as much as £10m or 4% of your annual turnover (whichever is the greatest) per incident? Do you believe that because you are a small business that these laws will not apply to you? Will you continue to send out your communication, newsletters and other marketing material without taking the necessary steps? Obtaining an ‘opt-in’ from the individuals in your database is just one step to protecting yourself. Should you make the decision to continue sending out emails, mailshots and other communication in the same manner as you have always done, without gaining the individuals specific consent, you may find yourselves receiving a ‘Subject Access Request’ (SAR). An SAR is a legal inquiry about why you have an individuals information, what you know about them and why you have it. You have to reply in a timely manner and you can’t charge for doing it. For additional guidance, the Information Commissioners Office has published various guidelines and checklists to help you to understand and assess your level of compliance with data protection legislation. 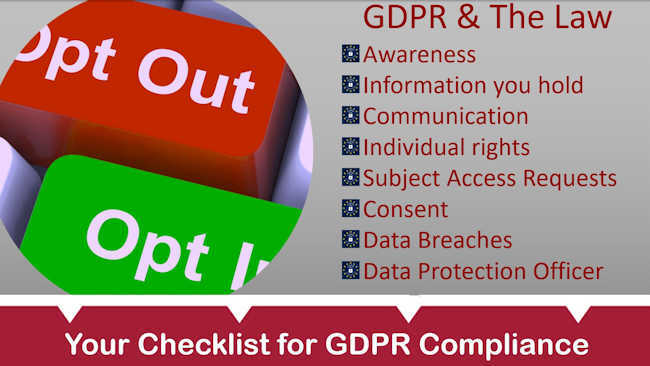 They have created a PDF called ‘GDPR: 12 steps to take now’ which you can download by clicking here and further information for data controllers and data processors can be found here. After considering all the information I have gleaned over the past few months from numerous seminars and events, I sent out an ‘opt-in’ email request to my database of existing and potential clients that I hold. To date, I have received a positive response from less than 10% of my list. I will carry out this exercise once or maybe twice more after which time all data of those individuals who have not responded positively, will be removed from my newsletter database. If you’d like to get more insights about GDPR from my own experiences so far, do call me on 01280 700405 or click here to ping me an email and let’s see how I can help you.